46 February/March 2018 unmanned systems inside T he European space community is em- bracing its role as an enabler of un- manned technologies. "Satellite com- munication is becoming indispensible infrastructure, along with 5G and microwave communication, for connected, cooperative and autonomous driving," EU Commissioner for Transport Violeta Bulc said. She called on the European space community, espe- cially satellite manufacturers and operators, to work together with car makers and other stakeholders. "We don't want you to compete," she said, "we want you to work together, to f ind solutions like the ones that are emerging right now from hybrid communications and that give us more opportunity to create safe and secure autonomous driving solutions." Galileo, the European glob- al nav igation satellite system (GNSS), Bulc said, is a key en- abler of new drone services and solutions that could soon be available even in densely popu- lated env ironments. 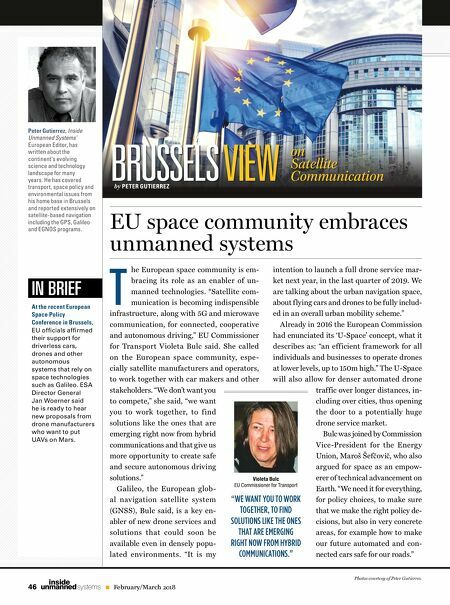 "It is my EU space community embraces unmanned systems Peter Gutierrez, Inside Unmanned SystemsÕ European Editor, has written about the continent's evolving science and technology landscape for many years. He has covered transport, space policy and environmental issues from his home base in Brussels and reported extensively on satellite-based navigation including the GPS, Galileo and EGNOS programs. IN BRIEF At the recent European Space Policy Conference in Brussels, EU offi cials affi rmed their support for driverless cars, drones and other autonomous systems that rely on space technologies such as Galileo. ESA Director General Jan Woerner said he is ready to hear new proposals from drone manufacturers who want to put UAVs on Mars. intention to launch a full drone service mar- ket next year, in the last quarter of 2019. We are talking about the urban navigation space, about f lying cars and drones to be fully includ- ed in an overall urban mobility scheme." Already in 2016 the European Commission had enunciated its 'U-Space' concept, what it describes as: "an efficient framework for all individuals and businesses to operate drones at lower levels, up to 150m high." The U-Space will also allow for denser automated drone traffic over longer distances, in- cluding over cities, thus opening the door to a potentially huge drone service market. Bulc was joined by Commission Vice-President for the Energ y Union, Maroš Šefčovič, who also argued for space as an empow- erer of technical advancement on Earth. "We need it for everything, for policy choices, to make sure that we make the right policy de- cisions, but also in very concrete areas, for example how to make our future automated and con- nected cars safe for our roads." 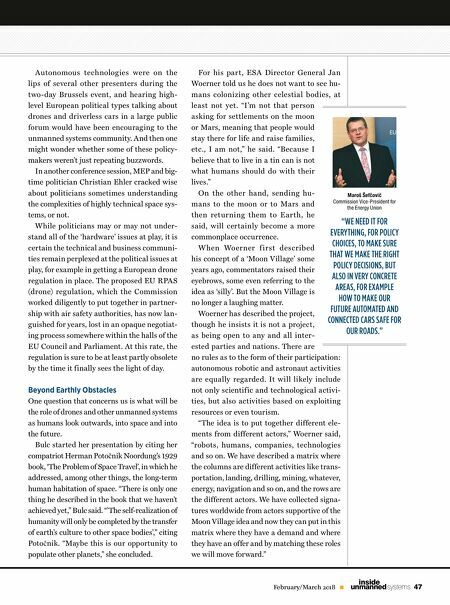 BRUSSELS VIEW on Satellite Communication by PETER GUTIERREZ "WE WANT YOU TO WORK TOGETHER, TO FIND SOLUTIONS LIKE THE ONES THAT ARE EMERGING RIGHT NOW FROM HYBRID COMMUNICATIONS." Violeta Bulc EU Commissioner for Transport Photos courtesy of Peter Gutierrez.